Dean Furman is on his way home from the Africa Cup of Nations after South Africa were knocked out of the tournament. And he could be back in time to face Chesterfield on Saturday. Bafana Banafa had to beat Ghana to stand any chance of progressing beyond the group stage and took the lead after Mandla Masango struck from 25 yards inside 20 minutes. However, Ghana hit back through John Boye and Andre Aryew to claim a 2-1 win and leave South Africa bottom of Group C following their 3-1 defeat to Algeria and 1-1 draw with Senegal. Furman said: “We took the lead then allowed them back into the game. We sat too deep and ultimately that proved costly for us. “I thought we had good moments but we were not as good as in the previous two games. “Second half we were poor, we stopped playing the football that was so good for us over the two games. 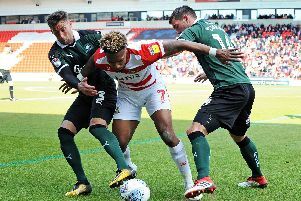 There is every chance Furman will be involved this weekend for Rovers but boss Paul Dickov will be wary of the effects that tournament football and long-distance travel will have had on the midfield man.